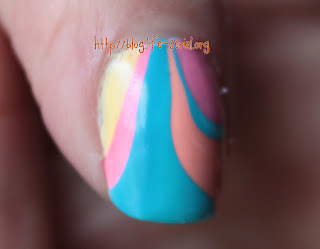 The one with Fail Art Thursday - Watermarble with the Finger Paints Gumdrops and Lollipops collection!! These polishes, all six polishes from the the new Finger Paints Gumdrops and Lollipops collection, are EXTREMELY difficult to watermarble with. They dried a tad bit too fast on the water surface, and when I tried to use my toothpick to make designs, all the polish came up on the water surface. More than once. Except for once! haha I only got one finger watermarbled during the 45 minutes I tried. But that's ok, because the design on this one is actually good! I actually got a decent design! First time ever I got a decent design at which I didn't groan! haha If I could have gotten any other decent designs, I would have featured them, too, but I couldn't get _any_ others! :) Would watermarbling in a smaller container help with drying time? I used a bigger bowl this time around.